The adsorption characteristics of light gases on basalt rock-based zeolite 4A (BR zeolite-4A) were systematically investigated to evaluate its potential application as an alternative adsorbent for adsorption-based separation processes. We used alkali fusion and hydrothermal procedure to prepare the nanostructured adsorbent, BR zeolite-4A, which was characterized with field emission scanning electron microscopy, X-ray diffraction, and carbon dioxide adsorption apparatus. The single component adsorption equilibrium for CO2, CH4, N2 and H2 on the BR zeolite-4A was volumetrically determined using a nanoPOROSITY adsorption analyzer at the temperature range from (288.15 to 308.15) K and pressure range from (0.1 to 110) kPa. The experimental results indicate that BR zeolite-4A showed higher adsorption capacities for CO2 compared to other light gases, indicating the suitable porous material for selective separation by adsorption. 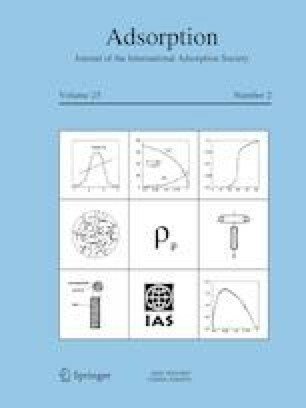 Three different isotherm equations, Langmuir, Toth, and Sips, were used to correlate the adsorption isotherm data and the most reasonable results obtained from the Sips model irrespective of the adsorption isotherm types. Isosteric heat of adsorption and adsorption energy distribution function values were calculated and used to further examine the surface energetic heterogeneity of BR zeolite-4A. The pure component adsorption isotherm results were also used to predict the adsorption selectivity for CO2/N2, CO2/CH4, CO2/H2, and CH4/H2 binary mixtures (50:50) at different pressure ranges using ideal adsorbed solution theory. Kyung-Jun Hwang and Min Jin Hwang have contributed equally to this work. This work was supported by the Basic Science Research Program through the National Research Foundation of Korea (NRF) funded by the Ministry of Education (Grant No. NRF-2017R1D1A3B03034385) and the author gratefully acknowledge the financial support from the Ministry of Trade, Industry and Energy (MOTIE) and the Korean Energy Technology Evaluation and Planning (KETEP) (Grant No. 20153030013010).